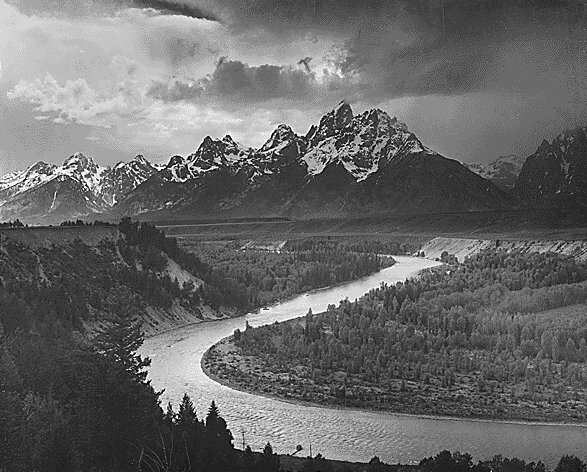 Featuring 25 photographs from American scenic photographer Ansel Adams, a pioneer in the movement to preserve the wilderness and one of the first to promote photography as an art form. 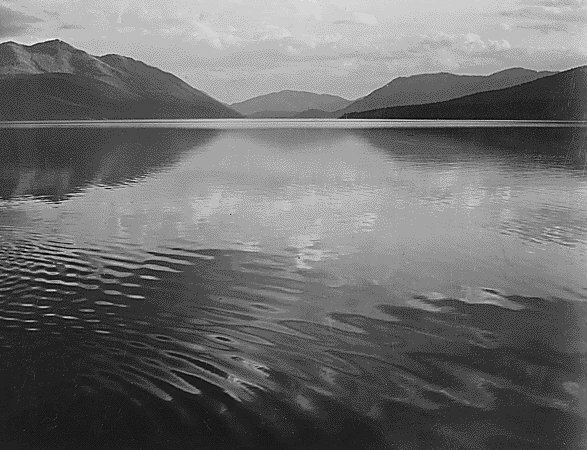 These photos were taken 1933-1942. 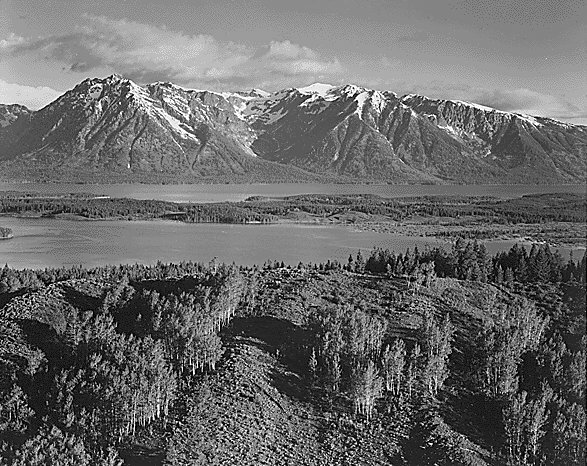 The Tetons and Snake River, Grand Teton National Park, Wyoming. McDonald Lake, Glacier National Park, Montana. 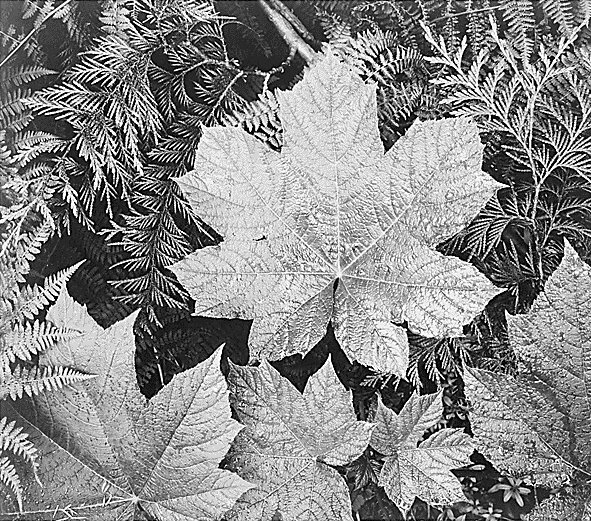 Close-up of leaves, Glacier National Park, Montana. 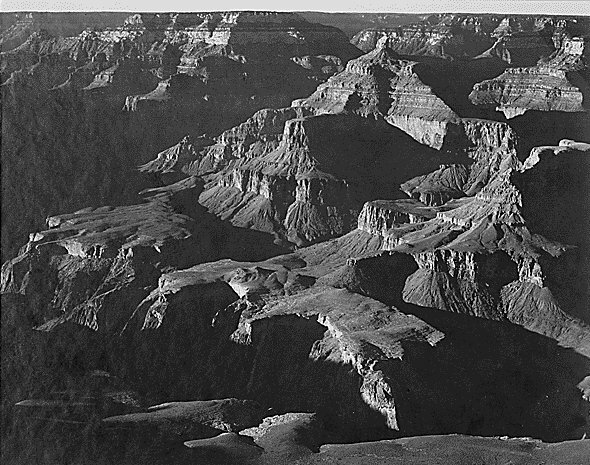 View with rock formation in foreground, Grand Canyon National Park, Arizona. 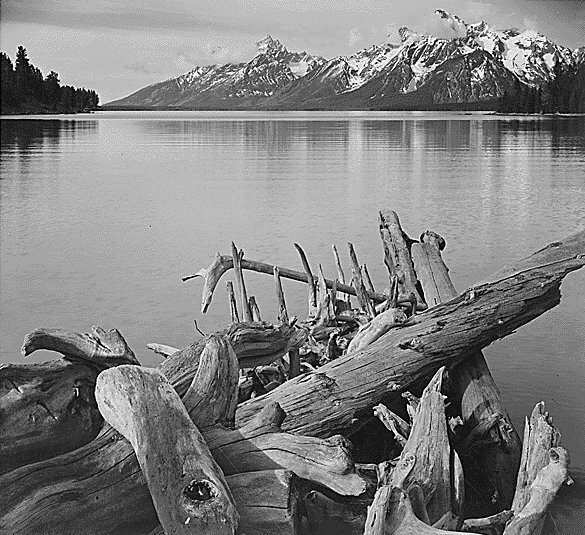 Jackson Lake in foreground, with Teton Range in background, Grand Teton National Park, Wyoming. 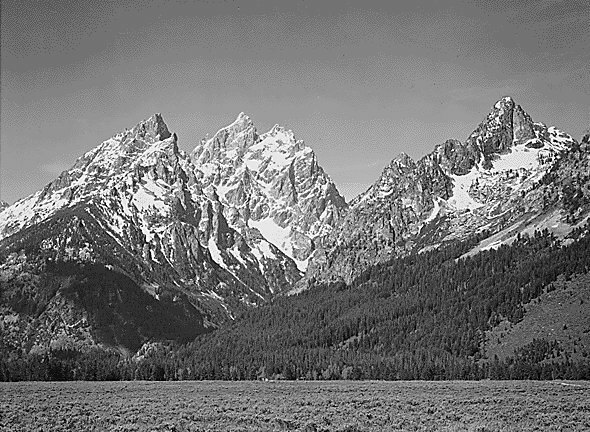 Grassy valley, tree covered mountain side and snow covered peaks, Grand Teton National Park, Wyoming. 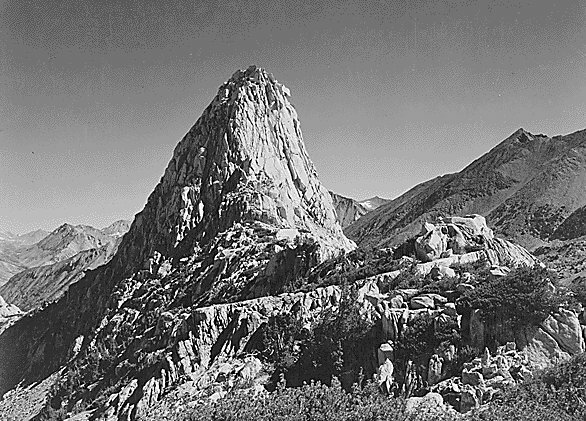 Fin Dome, Kings River Canyon, California. 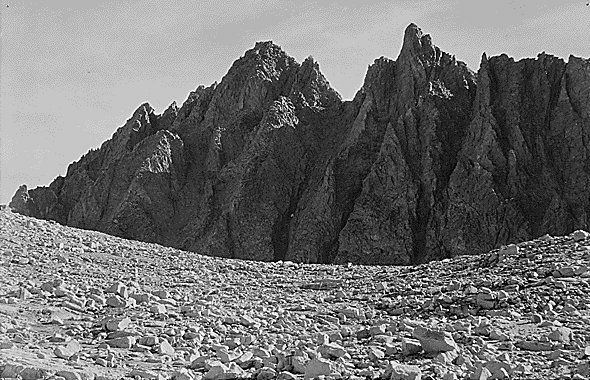 Junction Peak, Kings River Canyon, California. 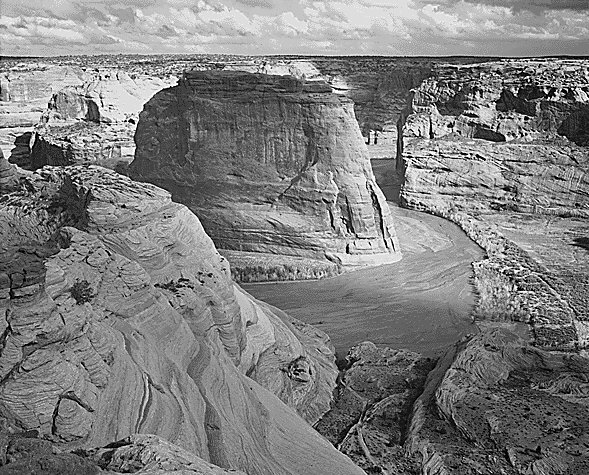 View of valley from mountain, Canyon de Chelly National Monument, Arizona. 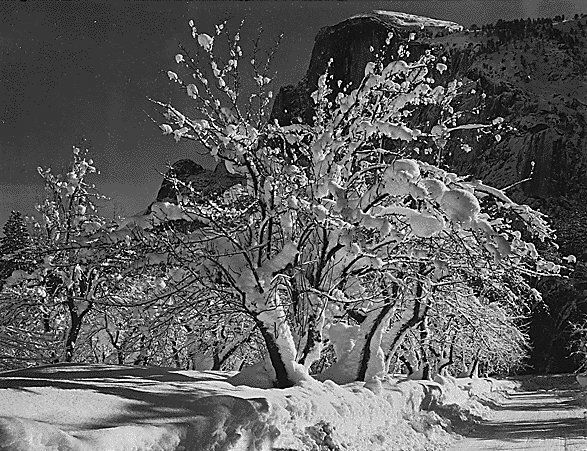 Trees with snow on branches, Yosemite, California. 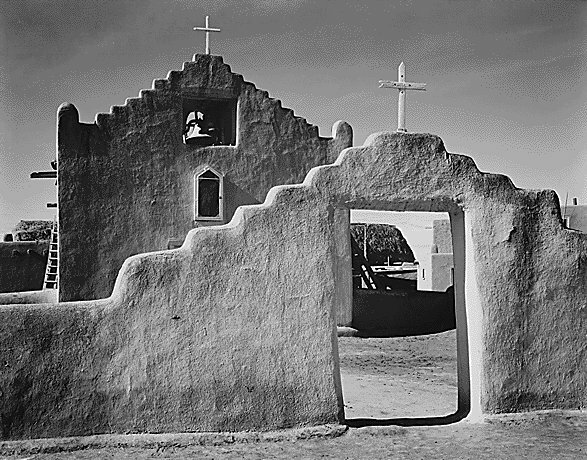 Church, Taos Pueblo National Historic Landmark, New Mexico. 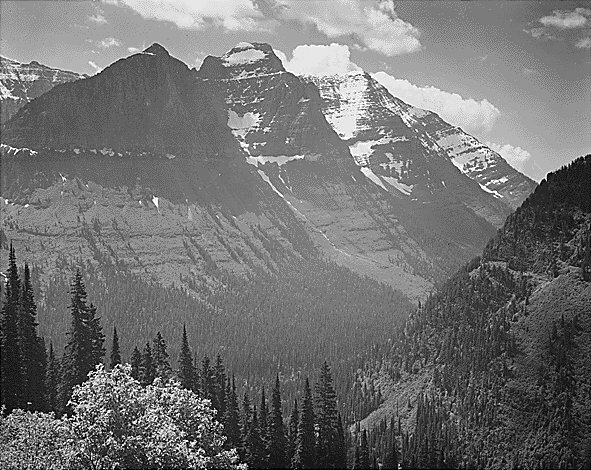 Valley, snow covered mountains in background, Glacier National Park, Montana. 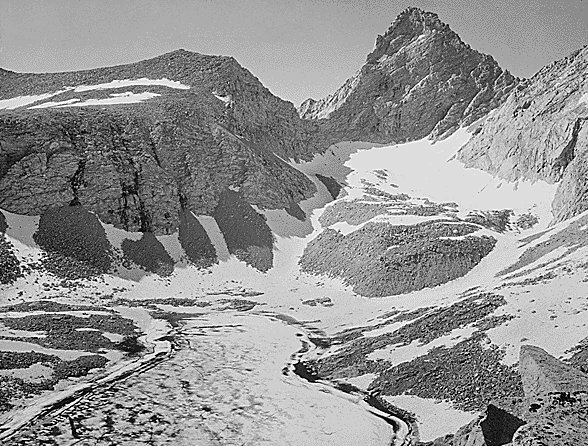 Bishop Pass, Kings River Canyon, California. 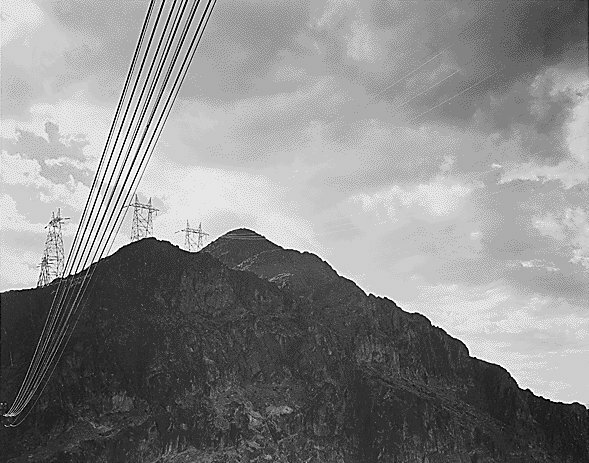 Looking toward a mountain with transmission lines, Boulder Dam in Arizona/Nevada. 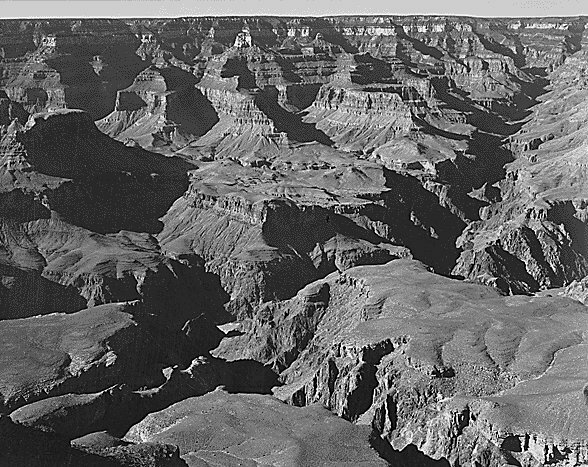 Canyon and ravine, Grand Canyon National Park, Arizona. 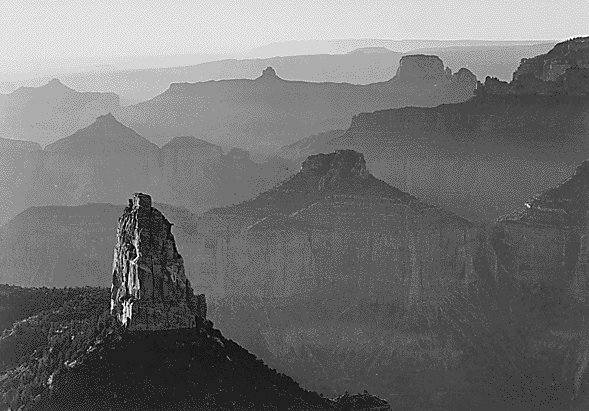 Looking down toward peak formations, Grand Canyon National Park, Arizona. 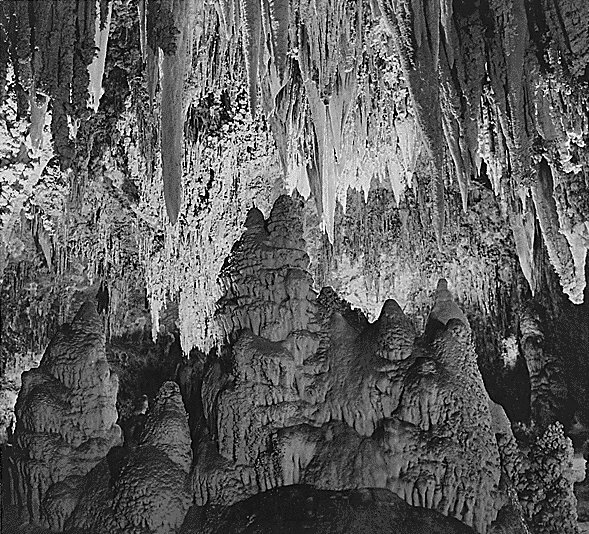 Formations along the wall of the Big Room, Carlsbad Caverns National Park, New Mexico. 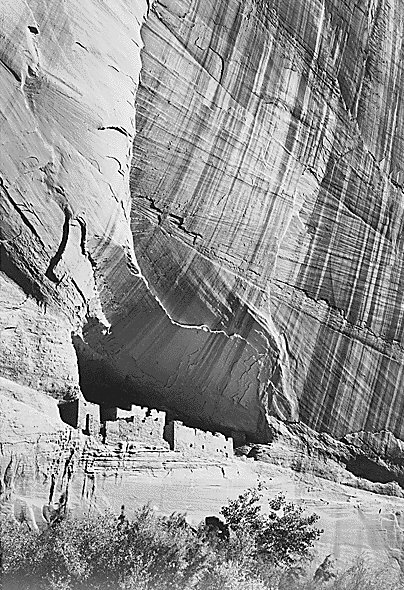 View from river valley, Canyon de Chelly National Monument, Arizona. 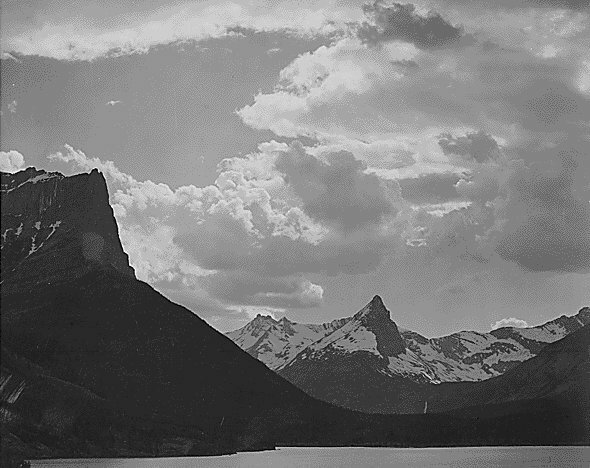 St. Mary's Lake, Glacier National Park, Montana. 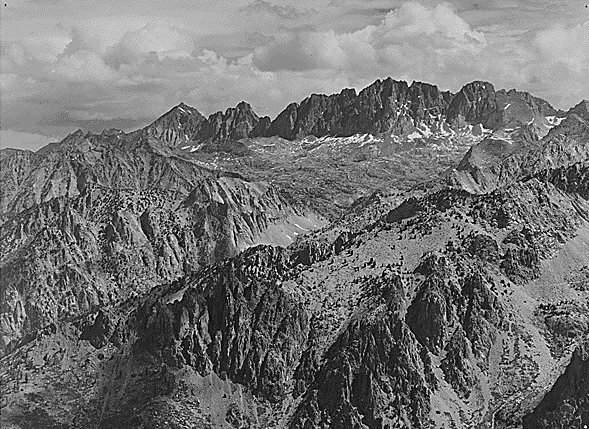 North Palisade from Windy Point, Kings River Canyon, California. 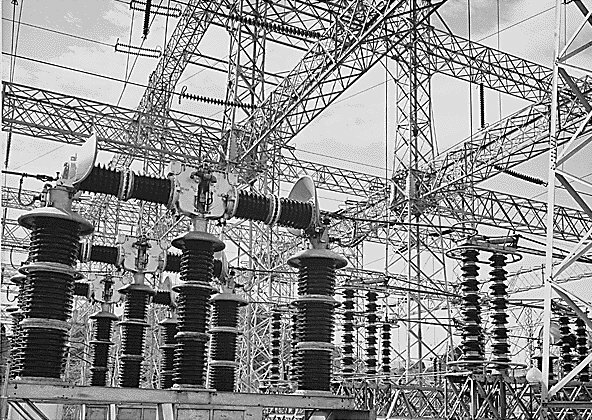 Electrical wires of power unit, Boulder Dam, in Arizona/Nevada. 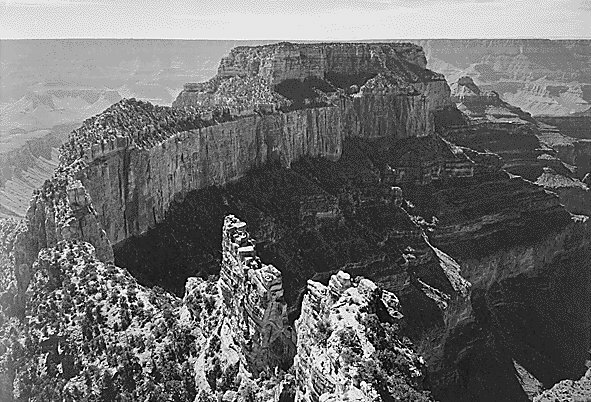 View of a curved cliff, Grand Canyon National Park, Arizona. 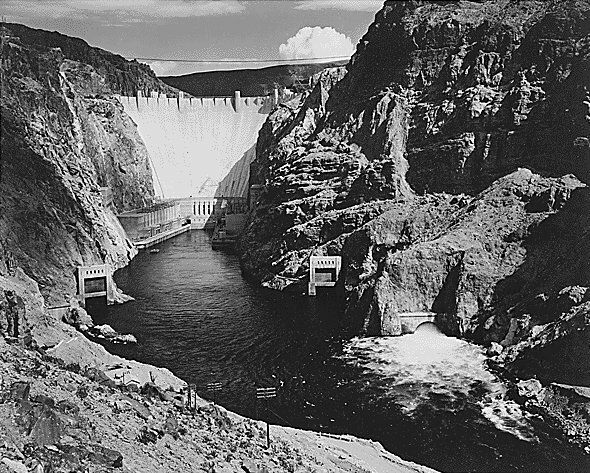 Looking across water to the dam, Boulder Dam, in Arizona/Nevada. 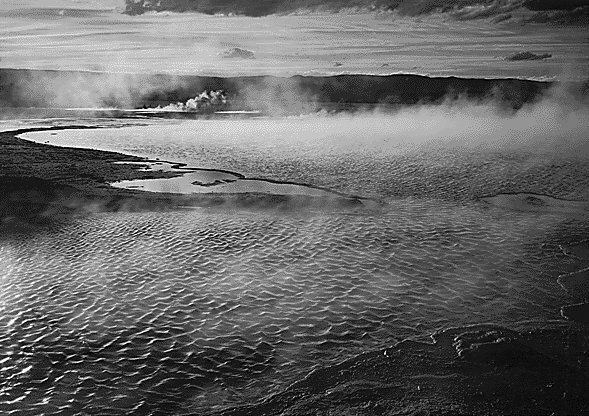 Geyser pool, Yellowstone National Park, Wyoming. 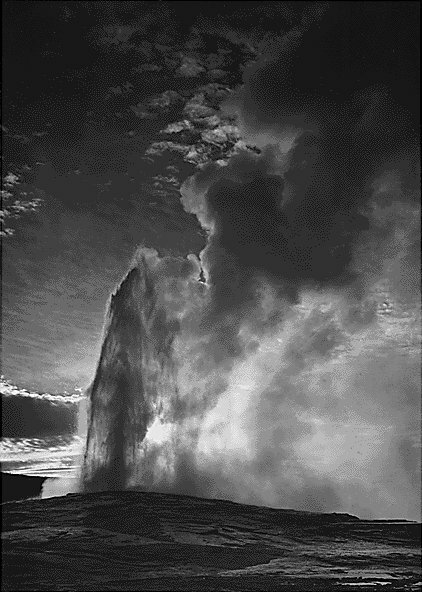 "Old Faithful" geyser, Yellowstone National Park, Wyoming.